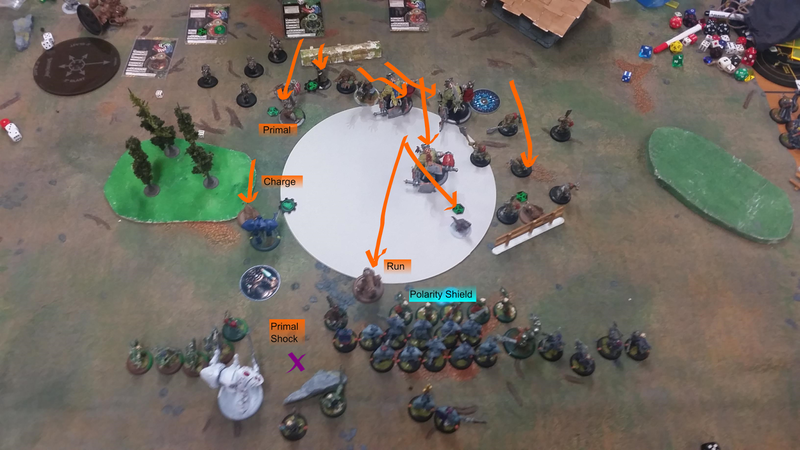 Retribution of Cyryst: Rahn Vs Dr. Arkadius, 50 points, Batrep. Rahn Vs Dr. Arkadius, 50 points, Batrep. One of a large number, of battle reports sitting in my to do box. This was my most recent game however. My opponent gave me the option of playing against Pigs or a real faction. I thought the fairest thing to do was dice it and let fate decide. I'm happy to get what I consider an easy game but expected at least Lord Carver when the dice chose Pigs. Alas I went off to buy snack food and mull over a list while my opponent made his. Then, I returned knowing I would play Rahn and not much more. Unpackaged from its container was a rather beastly looking Pig force and standing out as brazen as a pair of shaven rat balls were 2 Goraxe. End of Pigs turn 1 Squeeeee! I think this is a pretty bad Rahn list and I threw it up on the spot. Well in a way. For example I almost never take Sylys with Rahn, normally Sylys improves on a Warcasters accuracy for an assassination or helps keep focus costs down. But I find with Rahn I'm seldom doing anything but Telekinesis and the odd force hammer that I'm not hurting for the spare focus and with foc8 and free boost on feat the pseudo boost is often redundant. Imperitus is just there cause he is Imperitus. How is it not good? Telekinesis him and or the target that's 4 inches extra threat and done in the right order effective mat 9. The rest of the infantry is just what I figured a general brick cracking type of Rahn list could use. So there was a Forced Evoloutioned Road Hog staring me straight in the face, with a couple Razor Boars looking dangerously close. Arcanist advances and gives the Chimera a focus. Chimera runs to position between Road Hog and Razor Boar to have both inside Telekinesis range. Rahn activates, Feats Telekinesis' the Road Hog and Razor Boar forward and gives the Battle Mages Polarity Shield. Aiyanna advances Kisses the Road Hog and Holt shoots it a couple times. Road Hog Wild Aggressions into combat with my Magister. I realize his beasts have Wild Aggression. Artificer advances and Magno Blasts the Road Hog disengaging it from combat. Now the road hog is out of Dr. Arkadius' control. Storm falls Brutal Damage and put it down while another hits the Razor Boar and it Wild Aggressions into the edge of the forest. Battle Mages advanced and force bolt 2 more Razor Boars pulling them in and Knocking them Down. Storm fall Archers put Brutal into the Boars killing them. Killed the Road Hog and 2 Razor Boars. Not forgotten about Wild Aggression. Move enough stuff further up the board or clear myself out of the Kill Box. First turn Feating was pretty ballsy but I think it paid off. Primaled a Razor Boar and charged the Chimera. Ran his gun Boar close enough to Primal Shock Aiyanna to death. Quite horrifying. Feated to get his Gun Boar closer and deliver the Razor Boar with a free attack. Holt passed his morale check and just half the Chimera got wrecked so it was still good for another turn. In the hopes if this was a quick game I could have a second, I saw a pretty big opening for Imp and took it. Chimera mirages out of combat. Chimera advances to a safe distance to ark a Telekinesis at Dr. Arkadius. Sylys gives Rahn Arcane Secrets. Rahn rolls a boosted Telekinesis and grabs Dr. Arkadius and spins him round 2 inches closer. Rahn then Telekinesis' Imperitus forward. Magister advances and whipsnaps the closest War Hog, moving Imperitus another 3 inches forward. Arcanist gives Imperitus concentrated power. Imperitus charges Dr. Arkadius and connects. He sidesteps off the charge to be unengaged with the Goraxe. The Warlock has 2 transfers. Imperitus leaves him on 3 health and no transfers. Storm Fall Archers roll like bosses on the right flank killing 2 Razor Boars. Storm Fall Archers on the left fire star falls at the Goraxe setting him and Arkadius on fire. Sentinels charge the War Hog and Gun Boar. 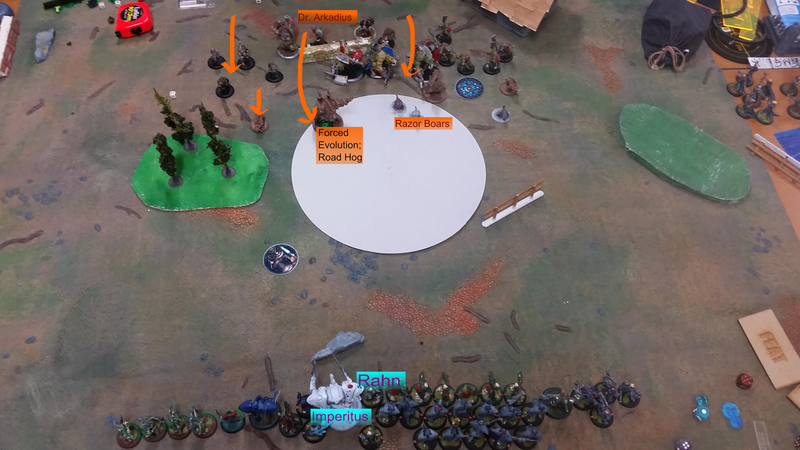 Battle Mages also charge the road hog and gun Boar, between both units both beasts die. 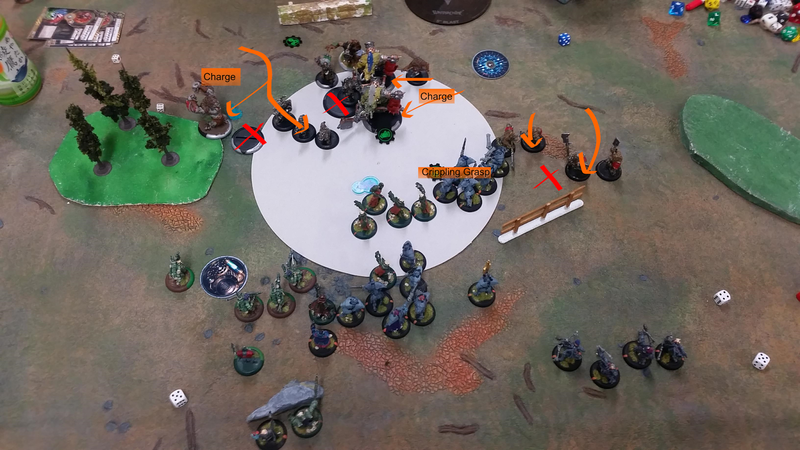 The Artificer uses Pathfinder to charge the Slaughter Housers over the fence. The first attack misses but the second connects and he uses beat back to advance into a blocking position. To be honest I can't believe Dr. Arkadius survives, not only a fully loaded Imperitus but the fire goes out next turn. The good news is he still has to kill a full health Imperitus in one turn with just 2 War hogs. 2 War Hogs one Primaled are used to kill Imperitus, just. It takes 3 Slaughterhousers to kill the Artificer. Dr. Arkadius sits in the wreck of Imperitus and casts Crippling Grasp on the Sentinels. Bonegrinders move into a blocking position. I'm not sure if he had many better options. Crippling grasp on the Sentinels was sound and having to kill Imperitus essential. Taking out the Chimera was also good play. At this point it is concievable to play long and go for scenario, even with Crippling Grasp a full unit of sentinels hurt enough and the Battle Mages to help on Scenario. However I think it more prudent at this point to point the ailing warlock out of his misery so I go for a second assassination attempt. Dr. Arkadius was on 4 transfers and in a wreck for cover with 3 hit points left. 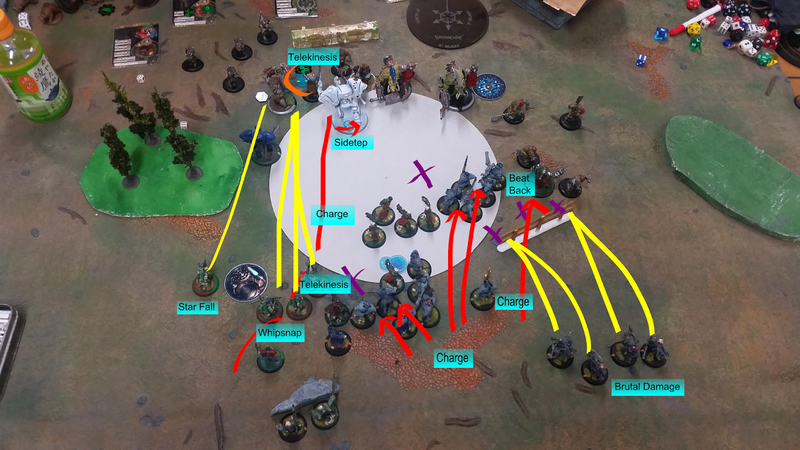 Rahn Telekinesis' himself over the rock then advances.Then casts a Force hammer at 12 inches at Dr. Arkadius slamming him into Targ behind him. Sentinels activate and kill a couple Slaughterhousers, 2 Sentinels kill a Battle Mage who is in the way of the second unit of Storm Fall Archers. 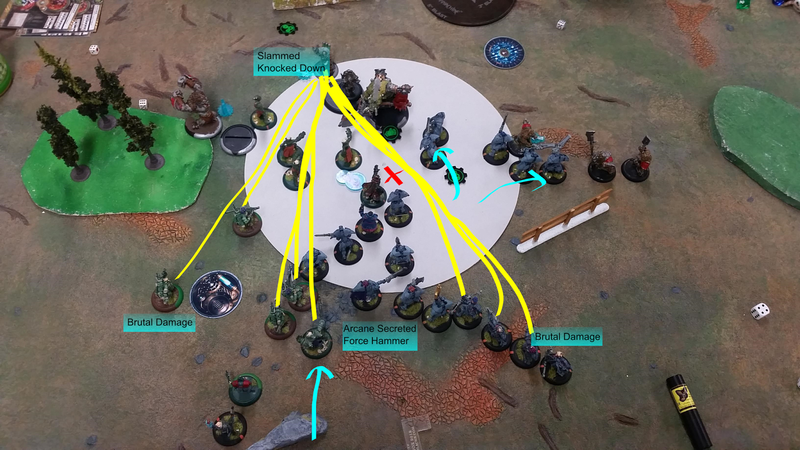 First unit of stormfall archers deliver Brutal Damage shots into Dr. Arkadius one misses and 3 connect the damage transfer kills a Goraxe along with a shield guard. 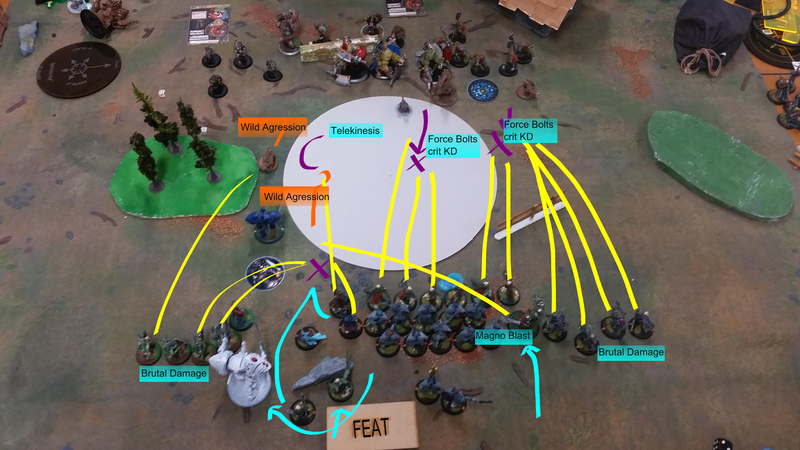 The second unit advance to use the space created by the Sentinel and unload, the second and third transfer kill a War Hog and the third Stormfall nets the kill. Is this a good Rahn list? The thing that gets me about Rahn is I'm never quite sure how to build his lists. You could go jack heavy or even light jack heavy he can use them, but then I find it lacking punch. Sentinels are great but he doesnt really help deliver them like eVyros, Ossyan or Gareth does. Stormfalls are also cool but all of that blast damage redundancy kind of hurts, especially when your playing games on the clock and you want to spend 2 minutes thinking about how best to use Force Blast or Telekinesis and not rolling deviations on the Storm Falls. Imperitus failed to do the job, but so far I'm not surprised, in the previous game it couldn't kill a Carnivean. Rahn could improve the threat but only almost as much as again pVyros, Ossyan, Garyth or even Ravyn. 2 Inches for 2 focus or with Rahn 4 for 4. If I didnt need to cast the second Telekinesis a Force Hammer for knock down would have been a safer play. Here is me thinking mat 9 p+s 19 jack with 4 attacks would be enough. I think Rahn would still prefer a Pheonix or two Mage Hunter Assassins and maybe Infiltrators.